80 million years old and still beautiful | Error Ink. ← September 24, 2007: 10:17 a.m.
My point and shoot Kodak EasyShare C663, and my much wanting photography skills, refused to produce any non-blurred, close-up of this 80 million year old sea creature. Deep in the heart of Canada a miner unearthed the remains of a fossilized sea creature that accessorized Helen Mirren’s 2006 Primetime Emmy Awards’ outfit. Today the creature made its appearance in New York. 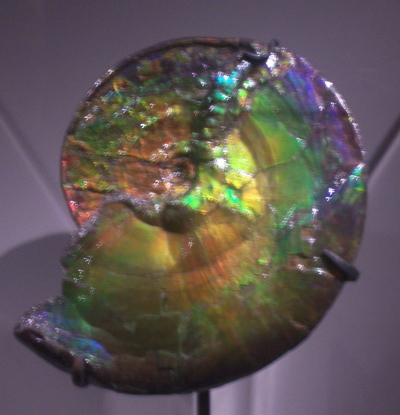 An 80-million-year-old iridescent shell reflecting the colors of the rainbow and spanning two feet in diameter brightened the 77th Street Grand Gallery of the American Museum of National History (AMNH). Ammonites, sea creatures dated to the Upper Cretaceous period, help determine the age of rocks, as well as pinpoint the location of ancient seas. “Ammonites help scientists piece together the history of the world,” said Neil H. Landman, Curator-in-Charge of Fossil Invertebrates in the Division of Paleontology for the AMNH in New York. The ancient snail-like creatures, whether colorful or not, serve as specimens for study by scientists like Landen. However, the colorful material culled from ammonites, and known as the gemstone ammolite, is fit for the jewelry, and wallets, of Hollywood celebrities. Ammolite gemstones cost the same as diamonds; Mirren’s Emmy’s jewelry was priced between $2,000 and $5,000 apiece. However, the scientific value of these ancient marine animals brought one of the largest ammonite specimens for display in New York. Korite International, a Canadian mining company that owns 90 percent of the world’s ammolite deposit, donated the fossil. Korite International, and its sister company Canada Fossil Ltd. mine the Canadian province of Alberta for ammonite, as well as other fossils and gems. After millions of year, and the effects of high pressure and temperatures, the shell of an ammonite, a creamy-pearl color in its natural state, changes to an iridescent coloration, which then sells as a gemstone. The ammolite gemstone is one of three gemstones, along with pearls and amber, produced by living organisms. “Ammolite is the sleeping beauty of the gem world,” said Oschipok. Along with Helen Mirren, celebrities James Gandolfini, Debra Messing and Howie Mandel, each received a piece of ammolite at the Emmy Awards. “Ammolite is considered the rarest gemstone in the world. This is for the woman that thinks she has everything, and wants something new,” said Oschipok as he turned his ammolite ring, which he valued at $3,000, on his finger. Why shouldn’t one post the gratuitous PR photo? Look, even cute little boys were enjoying looking at the colorful ammonite!